It’s setting soon after the sun, but it’s in the same part of the sky as this weekend’s spectacular display of the moon, Venus and Jupiter. 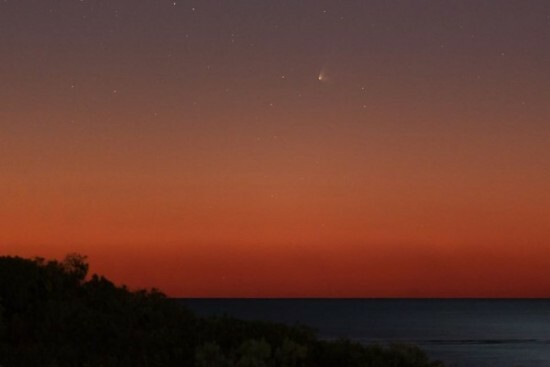 A nice little comet is briefly appearing in southern hemisphere skies over the next few days. Last night was the first good night with it setting at astronomical twilight. Over the next few nights it will climb higher but also fade as it leaves the sun. Friday night it will sit around 1/2 way between the moon and Jupiter. Best seen between 6:40 and 7 pm. Saturday night it will be around 3 degrees below and slightly left of the moon. Best seen in binoculars. Colin said he only saw the comet in binoculars, by the way, and that twilight was too bright to view it with the unaided eye. He said he was going to try to capture the comet near the moon this weekend, so stay tuned! 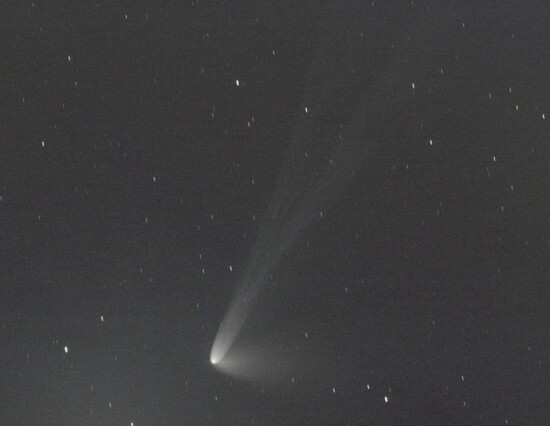 He also provided this (somewhat rough) image showing the tail of the comet in more detail. Thank you, Colin! Visit Colin Legg Photography on Facebook. Visit Colin Legg’s Vimeo page. 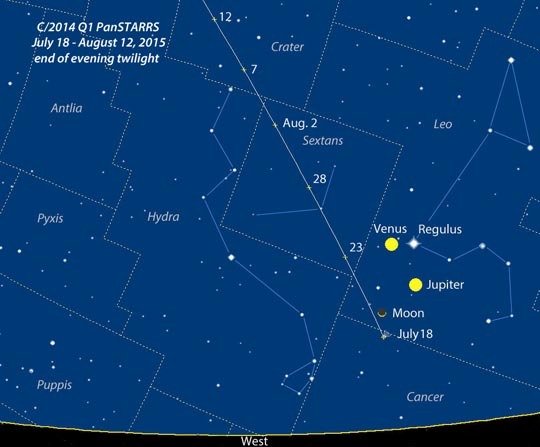 The comet passed perihelion – its closest point to the sun – on July 6. Its current magnitude is 4, within the limit for visibility with the unaided eye. But it’s against a background of bright twilight and thus very, very difficult to see, especially from the Northern Hemisphere. It’s just above the treetops at sunset and quickly follows the sun below the western horizon. More detail on C/2014 Q1 (PANSTARRS) from Heavens Above. More detail on C/2014 Q1 (PANSTARRS) from skyandtelescope.com. More detail on C/2014 Q1 (PANSTARRS) from theskylive.com. Can’t see the comet? 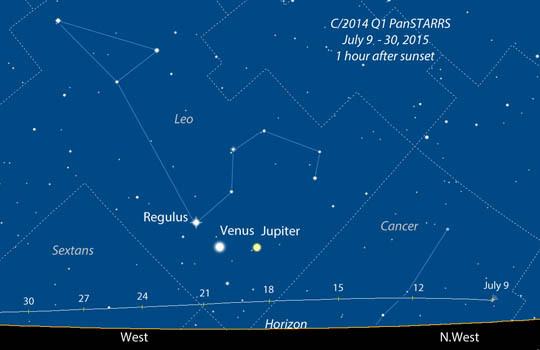 Don’t miss the moon, Venus and Jupiter on July 18! Read more. Bottom line: If Comet C/2014 Q1 (PANSTARRS) were in a darker sky, we’d all be rushing out to see it. 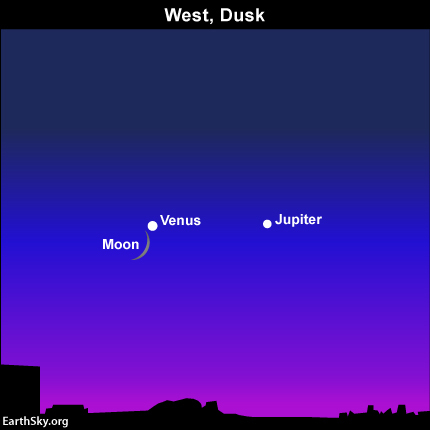 As it is, Southern Hemisphere observers might catch it over the next few days, in the same part of the sky as this weekend’s spectacular display of the moon, Venus and Jupiter.